"Spectacle and Sacrifice: The Ritual Foundations of Village Life in North China"
"In the ritual world of a group of rural settlements in Shanxi province in pre-1949 North China, temple festivals, with their giant processions, elaborate rituals, and operas, were the most important influence on the symbolic universe of ordinary villagers and demonstrate their remarkable capacity for religious and artistic creation. UC Berkeley History Professor David Johnson's new book describes the great festivals as their supreme collective achievements, carried out virtually without assistance from local officials or educated elites, clerical or lay. 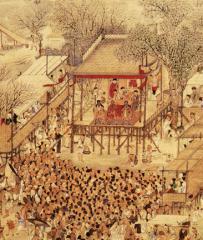 Chinese culture was a performance culture, and ritual was the highest form of performance. Village ritual life everywhere in pre-revolutionary China was complex, conservative, and extraordinarily diverse. Festivals and their associated rituals and operas provided the emotional and intellectual materials out of which ordinary people constructed their ideas about the world of men and the realm of the gods. It is, David Johnson argues, impossible to form an adequate idea of traditional Chinese society without a thorough understanding of village ritual. Newly discovered liturgical manuscripts allow him to reconstruct North Chinese temple festivals in unprecedented detail and prove that they are sharply different from the Daoist- and Buddhist-based communal rituals of South China. Introduced and moderated by Wen-hsin Yeh, Richard H. and Laurie C. Morrison Professor of History, and Director, Institute of East Asian Studies." --I'm going to go hear this talk tomorrow, I haven't seen the book yet but it looks interesting. Join me if you've got the time and you're in the area.